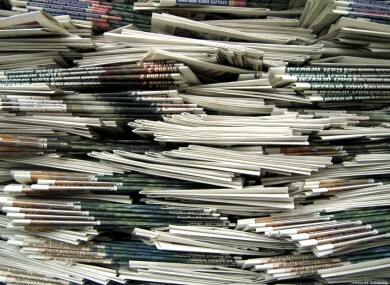 NEW INDEPENDENT FIGURES show that the circulation of most Irish newspapers fell in the second half of 2011, though Sunday newspapers have seen circulation increase as a number of rival titles cease circulation. Figures released by the Audit Bureau of Circulations (ABC) this morning show that most newspapers saw declining sales, with all three national broadsheet titles showing decreases. Circulation of The Irish Times has fallen below the 100,000 mark for the first time in recent years, with daily sales now standing at 96,150, compared to 100,951 in the first half of the year and 102,543 in the second half of 2010 – an annual fall of 6.23 per cent. Sales of the Irish Independent have also fallen, though by a lesser margin – its drop from 138,510 in the second half of 2010 to 131,161 is a fall of 5.3 per cent. Sales of the newspaper’s ‘compact’ edition account for 65 per cent of its sales. The Independent’s sister title, the Evening Herald, was the only daily paper to see its circulation increase over the last six months: its circulation of 62,411 copies is up by 0.8 per cent on the 61,936 it recorded between January and June. Year on year, however, its circulation is down 4.6 per cent, with sales of 65,435 in the second half of 2010. The Irish Examiner saw circulation fall by 8.5 per cent year-on-year – from 46,011 to 42,083. The Cork-based Evening Echo saw its circulation drop by 12.5 per cent, from 21,302 in the second half of 2010 to an average of 18,632 in the corresponding period of 2011. The Sunday World is now the highest-selling paper in the country, with its circulation virtually unchanged year-on-year, from 251,334 to 251,455 – usurping the Sunday Independent, whose sales fall by 1.4 per cent from 254,311 to 250,641. Sunday titles generally saw their circulations boosted from the first half of the year, likely attributable to the cessation of the Irish News of the World which had sold 113,111 copies in the first half of the year before it closed in the end of February. The Sunday Mirror saw the biggest sales increase – with sales now standing at 61,998, some 52 per cent up from 40,785 six months previously – while the Irish Mail on Sunday saw its sales grow by 1.8 per cent, from 113,160 to 115,186. The Sunday Times also made gains, with circulation up from 110,692 to 114,614 (an increase of 3.5 per cent). The Sunday Business Post, which has biannual circulation figures, saw circulation fall from 45,696 a year ago to 44,529 today, a fall of 2.6 per cent. The Sunday sales figures may see significant flux in the coming months as The Sun launches a Sunday edition, in a bid to recoup some of the readership lost by the closure of the News of the World last year. Figures for most tabloid papers form part of the monthly figures released by their British parent titles, where circulation figures are produced monthly. Nonetheless, each has seen circulation fall when compared to figures from six months ago. The Irish Sun saw circulation fall by 8.3 per cent, from 79,893 to 73,283, while the Irish Daily Star’s sales fell by 4.7 per cent, from 80,349 to 76,560. Sales of the Irish Mirror fell by 4.1 per cent, from 61,998 to 59,470, while the Irish Daily Mail saw circulation fall from 51,072 to 50,328, a drop of 1.46 per cent. Separate figures, released by the Joint National Readership Survey last week, showed that newspaper readership had declined by 2.4 per cent in 2011 compared to 2010, though 2.89 million adults – 81 per cent of the adult population – still read print editions of newspapers. Email “New figures show falling circulation for most Irish daily newspapers”. Feedback on “New figures show falling circulation for most Irish daily newspapers”.